We are all familiar with the traditional Buddhist phrases “May all beings be happy…May all beings be free from suffering.” For many of us, this incantation of the Brahma Vihara qualities of loving-kindness and compassion encapsulates the essence of the Buddha’s teaching, offering a simple yet profound guiding compass as we navigate our way through life and ever redefine our relationship to the world. Implicit in these invocations is another of Buddhism’s essential tenets – the dharma applies to all beings, from the tiniest insect to the Buddha himself. We are taught that the First Precept’s admonition against killing is not limited to humans but extends to all creatures, seen and unseen. We are taught that suffering is suffering, regardless of its manifestation. To make an ethical distinction between the suffering of humans and the suffering of animals is to be governed by delusion, creating a duality that does not exist. Just as we would not consider harming a human, likewise our moral code extends to animals. In a recent article in Lion’s Roar a number of prominent Buddhist teachers discussed the current political situation in this country and made a call for action, asking us to stand up against social injustice in whatever form it takes. While the goal of skillful interaction with the world is certainly laudable, the message did not go far enough. In pointing to racism, gender- and sexual orientation-based violence, xenophobia, economic injustice, war, and environmental degradation, it neglected the one area where as individuals we have the greatest power to effect positive change – our treatment of animals. But the number of animals killed is only a part of the story. The conditions of today’s factory farms are nothing short of brutal. Birds are crammed into windowless sheds, debeaked without anesthesia to minimize the harm caused by their biting and pecking at one another. Animals are routinely castrated and their tails cut off without anesthesia. Many people restrict themselves to “organic” meat and “free-range” eggs, but these farms are far from cruelty-free. In even the most humane hatcheries, male chicks are ground up alive or suffocated in plastic garbage bags the day they hatch. On even the most humane dairy farms, baby cows are taken from their mothers soon after birth, a traumatic experience for both mother and calf. Those males designated as veal calves are confined to a tiny space, unable to move, for their entire short lives to ensure that their flesh remains tender. However humane these “cruelty-free” farms claim to be, it is axiomatic that when people use animals for money, the animals suffer. It is for this reason that when the Buddha pronounced Right Livelihood, he considered the suffering of animals. Bhikkhu Bodhi discusses this in his comprehensive piece, The Noble Eight Fold Path, The Way to the End of Suffering, writing “The Buddha mentions five specific kinds of livelihood which bring harm to others and are therefore to be avoided: dealing in weapons, in living beings (including raising animals for slaughter as well as slave trade and prostitution), in meat production and butchery, in poisons, and in intoxicants.” If raising and butchering animals is Wrong Livelihood, how can eating animals be Right Action? For innumerable reasons, Mahamati, the Bodhisattva, whose nature is compassion, is not to eat any animal flesh. So much for more should Bodhisattvas, who are committed to being compassionate towards all sentient beings, and whose inner nature is compassion itself, choose to refrain from eating animal flesh. Animal flesh eating is forbidden by Me everywhere and for all time for those who abide in compassion. How can a bhikkshu, who hopes to become a deliverer of others, himself be living on the flesh of other sentient beings? Pure and earnest bhikkshus, if they are earnest and sincere, will never wear clothing made of silk, nor wear boots made of leather, because it involves the taking of life. Jivaka, I say that there are three instances in which meat should not be eaten: when it is seen, heard, or suspected [that the living being has been slaughtered for the bhikkhu]. I say that meat should not be eaten in these three instances. But rather than encourage the eating of animals, this teaching is more properly read as a severe limitation, allowing monks to eat animals only if it does not lead to additional killing. For laypeople, the question for each of us is whether by eating animals we are contributing to their suffering and untimely deaths, and the answer is inescapable. Even if the animal is not killed for us specifically, when we purchase meat at the store or at a restaurant, another animal will be killed to replace it. On a global scale, we are sustaining an industry devoted exclusively to the killing of animals. The fact that the causal chain leading from the killing of an animal to the food on our plate is hidden from sight does not shield us from responsibility. Not only does eating animals cause and contribute to their terrible suffering, but it also causes and contributes to the destruction of the earth. The industry that factory farms animals for slaughter is the single greatest cause of global warming which is destroying our planet. People who eat animals, including monks, often say that they are simply taking and eating what is given. But this not the Buddha’s teaching. In a story from the Mahavagga – the monastic code – a woman named Suppiya, when no meat is available, cuts a piece of her own thigh to prepare broth for an ailing monk, who eats it unknowingly. Upon hearing this, the Buddha rebukes the monk, instructing “Nor, monks, should you make use of flesh without inquiring about it. Whoever should (so) make use of it, there is an offence of wrong-doing.” The purpose of the three purities is to require practitioners to be mindful of what they are eating, and to simply accept meat without considering where it came from is inconsistent with the teachings. The teachings call on us to look inward, at our own defilements, and work to eradicate them. What could be more unwholesome than the greed, craving and desire that lead us to eat animals despite the immense suffering it causes? There is no other reason we continue to eat meat. It is up to each of us to examine this attachment and see it as it truly is. Only then can we live the life of compassion we hold as our aspiration. As Buddhism is being integrated into the United States, we in the early stages are in a unique position to shape its particular flavor, including the place of animals. Is Buddhism in this country going to condone the killing and eating of animals, or will it call on practitioners to not just speak of compassion but to put their words into practice, leading lives free from any complicity in the violence inherent in killing. 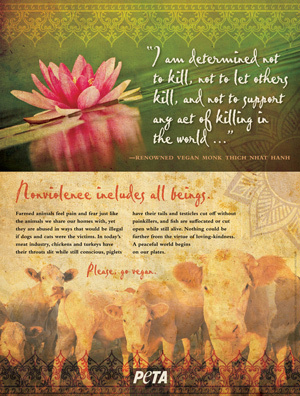 Dharma Voices for Animals was started to raise awareness of the effect of our actions on animals, and we now call upon the teachers who were signatories to the letter to begin an open and frank discussion of this issue, both among themselves and within their sanghas. It is too important to ignore when the lives of billions of animals lie in the balance. The teacher’s article begins with a quote from the Mahaparinirvana Sutra: As long as a society protects the vulnerable among them, they can be expected to prosper and not decline. Who in society is more vulnerable than the billions of animals subject to the cruelty and death of the meat industry? There is only one way to protect them and our planet, and that is to not eat them. Good blog. I am longtime vegan , actually vegan several years before Root Guru initiation into Kagu lineage.It is impossible for me to wrap my heart around any Buddhist eating dead animals. In Tibet where nothing grew, it is understandable although rather sad. But everywhere else there is a choice of a plant based diet. I make no exceptions . How do we speak of Bodhisattva , compassion, for all sentient beings Bodhicitta without honoring the value of other beings? We do not eat flesh. !